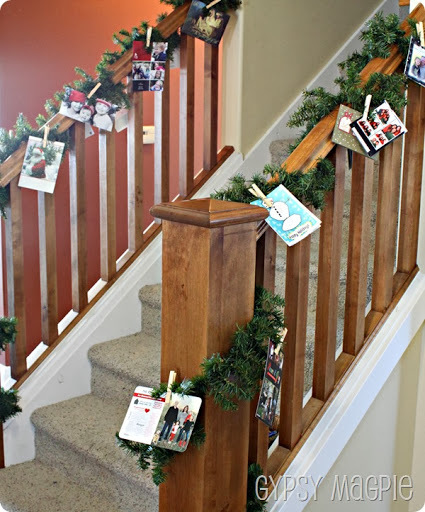 The main floor of our home doesn’t have a lot of walls to hang things on, so when we had our first Christmas in the house, 3 years ago, I was at a loss for where to hang the Christmas cards we received from our family and friends. I like to display them out in the open for my children to enjoy. They love to play “spot the relative” games with the cards and I love that they recognize names and faces of far off family. 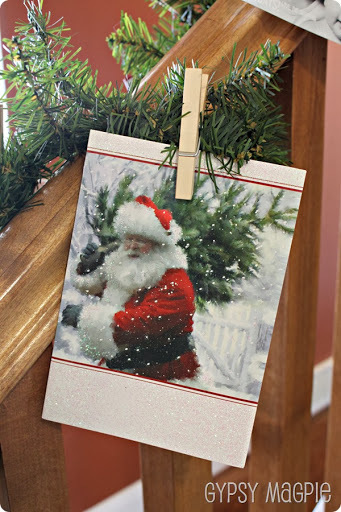 The Christmas cards help them keep a sense of connection with the people that we love and that connection is very important to me. I may not have had a lot of wall space, but I did have a stair railing in our entry way that was begging for some dressing up. 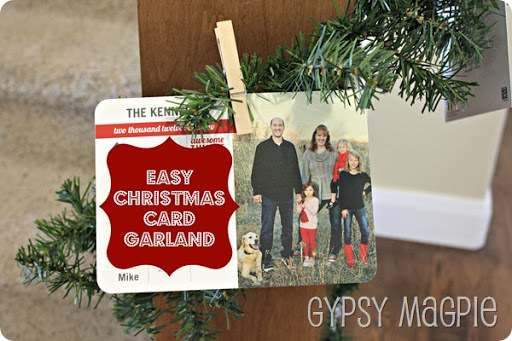 So, the merry merger of Christmas cards and Christmas décor gave way to our Christmas Card Garland and it didn’t cost me a dime. Next year I’d like to buy some beautiful lighted garland with pinecones in it, but for now our cheapy stuff from our old front porch works. My visions are grand, but frankly I’d much rather buy Christmas gifts than fancy Christmas garland, so I’m crossing my fingers that Taipan Trading does a big after Christmas sale! 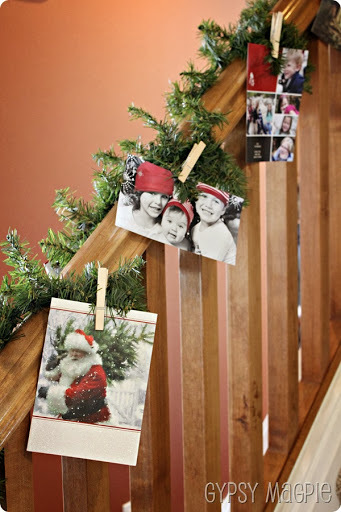 All it takes to make this Christmas Card Garland is clothespins, the garland of your choice, and your holiday cards. You could up the bling factor and decorate the clothespins with glitter, washi tape or paint, but I kind of dig the plain wood… plus I like that when the season is over, I can use the clothespins for my laundry again! Because this tradition has become so special to my kids, I let them be in charge of the mail and allow them to hang the Christmas cards however they want. I’m sure it could look fancier, but I don’t mind the homespun-ness of it all. It’s cozy and when I see my kids touching each face on every card, it all becomes beautiful in my eyes. When I took these photos last year, I never could have imagined that this year one special little fellow in our extended family would no longer be here on earth. I have to admit, I’m a little teary eyed as I type this. Baby Devin’s card was by far my children’s favorite Christmas card from last year. They loved the color and his chubby little cheeks. I can’t help but be reminded that family and our love for each other is all that matters. My simple little garland may not grace magazines, but it lights up the faces of my children and reminds us that each person represented in the cards that hang there are far more precious than any gift we could ever be given. clearly, i need your address so i can send you a christmas card this year.. maybe that way, i will get them done!!! love the way you displayed them!